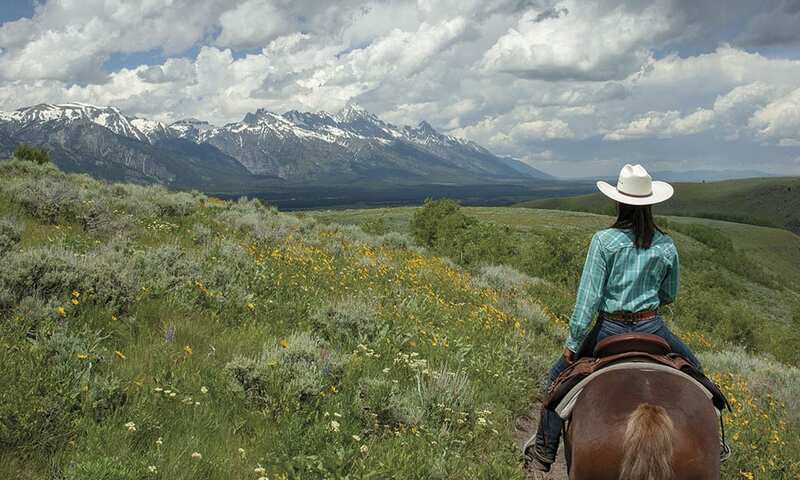 A visit to one of the most beautiful destinations in North America to test a new luxury pickup truck leaves the <i>COWGIRL</i> team breathless. A cool and colorful float down Wyoming’s Snake River. Photo by Darcy Bacha. Before us, a crystal-clear river wends through a lush green meadow. Beyond the meadow and jutting up through the pristine valley, stone-gray skyscraping mountains pierce the sky with their rugged, saw-toothed peaks. This is Jackson Hole, and those mountains are the Grand Tetons. As guests of GMC’s enthusiastic marketing crew for its Denali-branded luxury trim package, we’re here on behalf of COWGIRL’s readers to evaluate these rugged-yet-luxurious pickups and SUVs in one of the most sublime settings in America’s rugged Wild West. Our Spring Creek trail rides takes us atop the panoramic Gros Ventre Butte. Photo by Darcy Bacha. When we land in Jackson, the GMC/Page One team meets us in the baggage area and escorts us to a GMC Canyon midsize pickup. The finish is called “Red Quartz Tintcoat,” and it glows a deep garnet red. Although the Denali trim package may not be immediately obvious from the exterior, it’s evident once we slide into the luxurious leather-clad cab. We look at each other sideways with a “is this for real?” look on our faces. GMC’s automotive specialist, Gil Garibaldo, shows us how easily we can connect our iPhones to the in-vehicle Wi-Fi and the Apple Car Play system. Once underway, we see that the GMC Canyon Denali, with its advanced navigation and safety systems, along with its luxurious full-leather interior and heated and vented seats, is a modern cowgirl’s dream. Moreover, the luxury Denali trim package is available throughout the lineup of GMC’s pickups and SUVs—Canyon, Sierra, Terrain, Acadia, and Yukon—giving a cowgirl draft-horse capabilities with show-horse style in every category. GMC’s Eric Stanczak, makes a turn during the towing demonstration. Photo by Darcy Bacha. Punching in the address, we head for the Spring Creek Ranch, our home away for the next two nights. 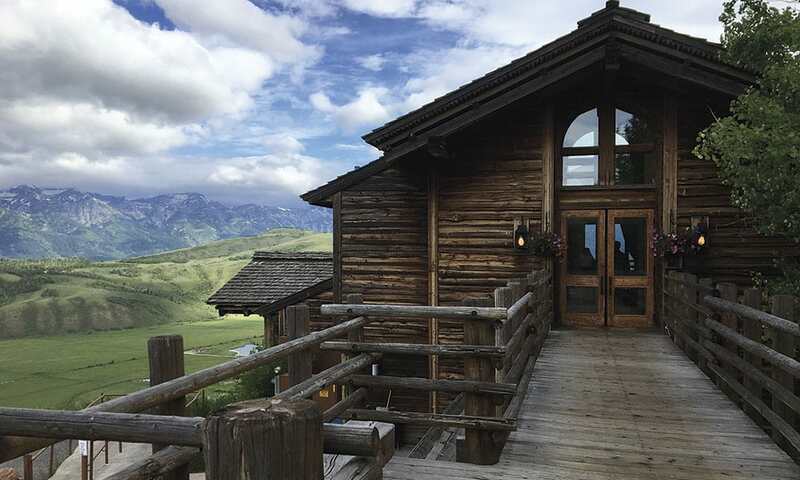 The rustic luxury resort, situated atop the East Gros Ventre Butte, offers stunning views of the valley and of the majestic Tetons, including the 13,775 foot Grand Teton Peak, commanding the horizon. We drop our bags in our well-appointed rooms and jump into our Canyon Denali. 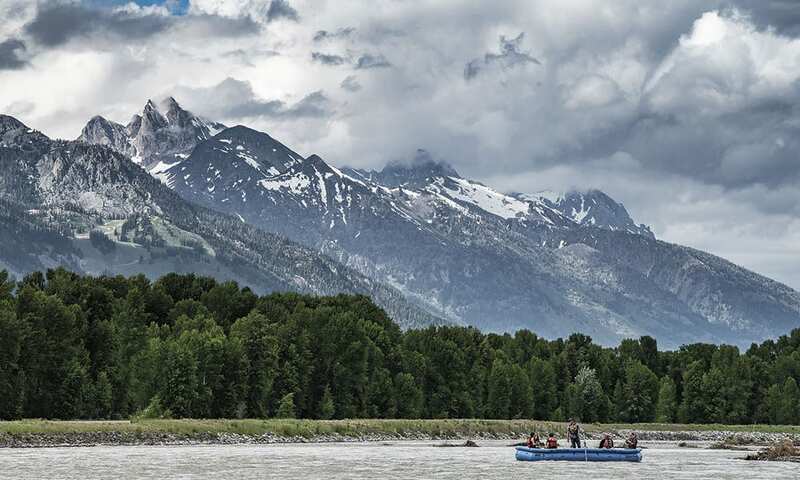 Our first destination is Wilson Bridge on the Snake River, where we’ll meet the guides from Barker-Ewing Whitewater, a premier Jackson Hole river outfitter, for a guided float down the Snake River. Fresh salads prepared by chef Jarrett Schwartz. Photo by Rhiannon Deremo. Our guide Zach mans the oars while imparting the area’s rich history, ably navigating the river to our destination a few miles downstream. After he maneuvers our raft to the riverbank, we hop off and climb up a slope. Just as the sun peeks through the clouds, we gaze upon a breathtaking dinner setting, seemingly in the middle of nowhere. The magical experience under tent was meticulously concocted by the fabulous crew from Genevieve Catering, under the guidance of Chef Jarrett Schwartz, who has received many awards for his modern and unique style of cuisine that he affectionately calls Innovative American. A bright Indigo table setting—complete with antlers. Photo by Stacey Lorton. 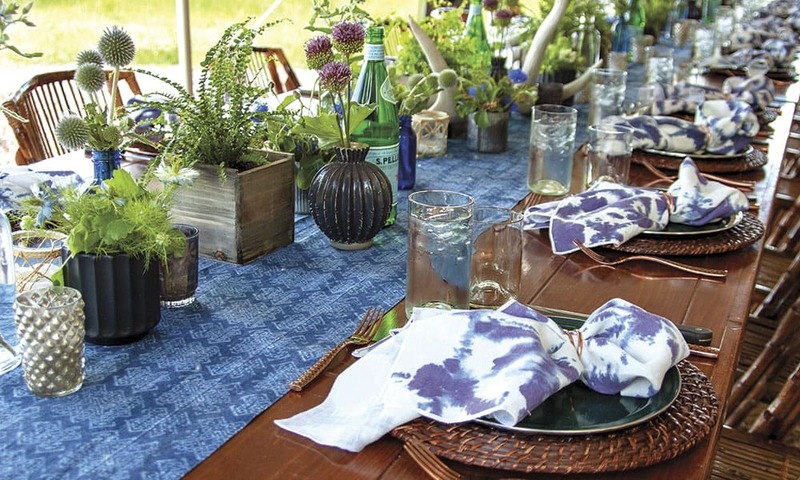 The setting sun casts a beautiful glow over a long single wooden table, set with Shibori indigo-dyed napkins, fresh ferns, antlers, and hammered copper utensils. A feast of smoked salmon with pickled cabbage, pecan-crusted steak, a fresh greens salad, garlic-and-herb roasted potatoes, a petite tomato salad with arugula and champagne vinaigrette, culminates in a scrumptious berry cobbler for dessert. We sit and chat while the sun drops towards the river, exchanging facts about Jackson Hole that we have learned from our guides. Returning to the resort, we wander the grounds, photographing the cloud-enshrouded Tetons at sunset. It was a beautiful ending to an extraordinary day. 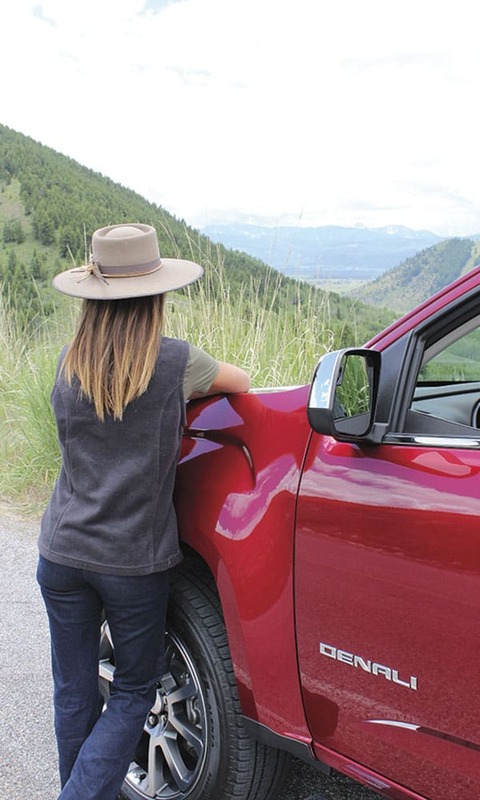 Cowgirl’s Stacey Lorton takes in the views along the climb to Spring Creek Ranch in the GMC Canyon Denali. Photo by Rhiannon Deremo. The following day, we gather bright and early to drive our now beloved Canyon Denali into the Grand Teton National Park to view wildlife. Our guide, a member of Spring Creek Ranch’s in-house natural department, directs us to a large meadow, where we immediately see native pronghorn antelope, several mule deer bucks, and a lone bison roaming the grassy valley. 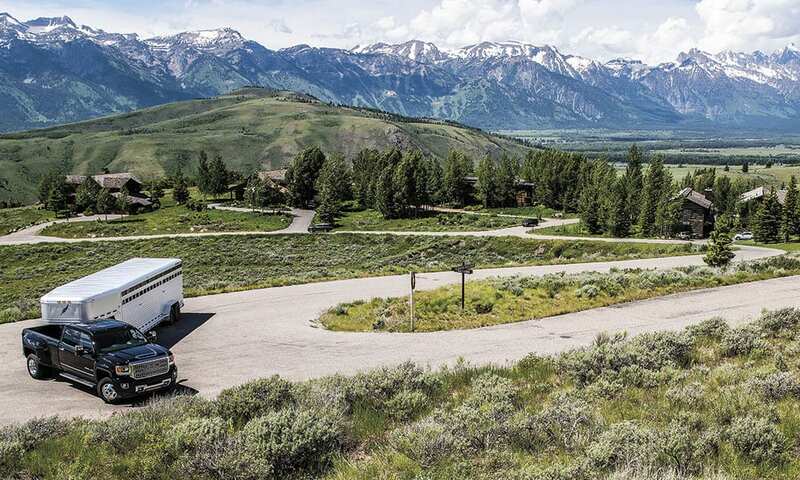 Moving on, we decide to take the scenic Grand Teton National Park drive that winds through the forests along the edge of the Snake River. We put the GMC pickup to the test on the well-used and heavily pitted road, and the Canyon Denali handled the rough terrain extraordinarily well, while still delivering a comfortable ride. Cowgirl participates in the towing demonstration. Photo by Rhiannon Deremo. Once back at Spring Creek Ranch, we rested a bit before embarking on our next adventure, a trail ride. We couldn’t wait to see the beautiful scenery from horseback! 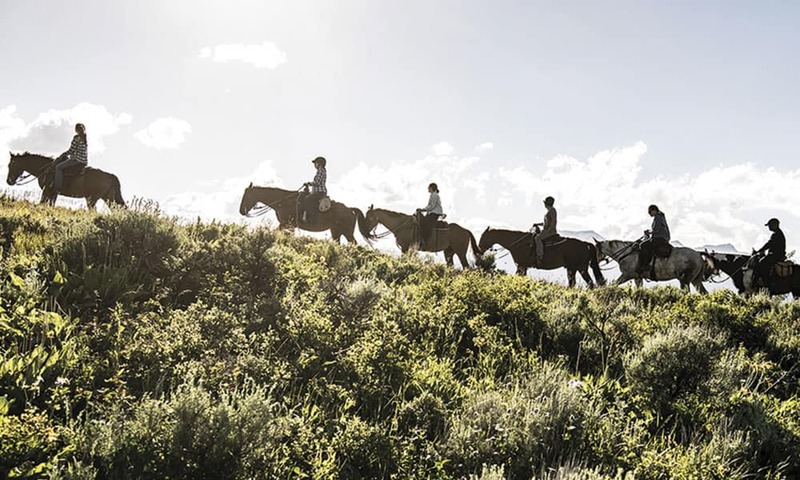 Spring Creek Ranch lays claim to some of the most scenic trail riding Jackson has to offer and its in-house Castagno Outfitters wasted no time getting us in the saddle and on the trail. Its location atop the East Gros Ventre Butte makes it ideal for 360-degree views of the stunning mountains that surround Jackson Hole, while also providing an overview of the National Elk Refuge—24,700 acres of federally protected land that provides winter habitat for thousands of migratory elk. Our guide Katie leads us out from the ranch weaving upwards along a hill flanking the paddocks. As we round the hill, we’re greeted with a breathtaking view of the Grand Tetons. The abundant wildflowers and native grasses brushed as high up as our knees. We don’t want the ride to end. Trail guide Katie leads the way across the East Gros Ventre Butte. Photo by Stacey Lorton. After dismounting and saying farewell to Katie and our horses, we’re off to still another adventure: a towing demonstration from GMC’s Chief Engineer of Full-Size Trucks, Eric Stanczak. He begins his demonstration at the base of a paved hill within the Spring Creek Ranch community, with a GMC Sierra 3500 Denali HD truck hitched up to a long stock trailer. We climb into the truck while he points out some of the Sierra’s towing capabilities and advancements, explaining key points of towing such as turning point, when to check which mirrors, and how to make a smooth stop. We all take turns in the driver’s seat, marveling at how the Sierra, with its innovations such as Surround Vision, Segment-First Rear Camera Mirror, and Hitch Guidance with Hitch View—paired with the smooth 3.0-liter Duramax Diesel and GMC’s iconic Allison automatic transmission—make towing such a large trailer a breeze! The GMC team makes a toast to a fun and successful trip. Photo by Darcy Bacha. After the towing demonstration, we freshen up and reconvene for supper. 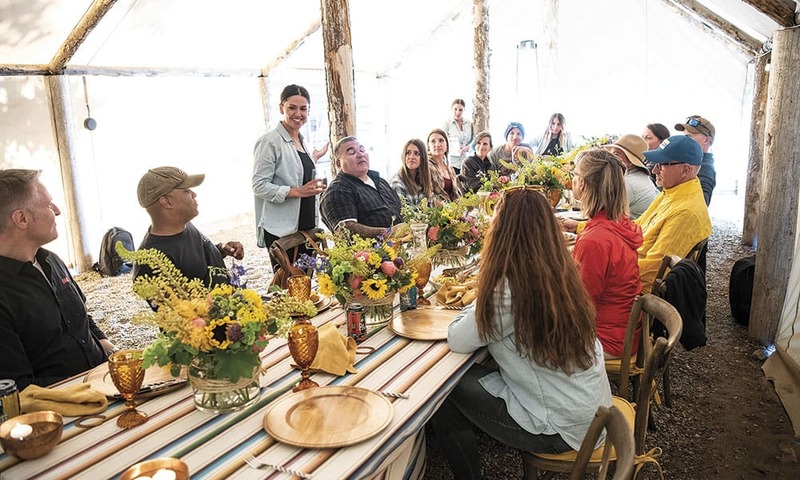 Nestling against the hillside and overlooking a paddock full of horses, a long single table adorned with bright yellow, pink, and blue serape linens, bright fresh wildflowers, and even a miniature copper horseshoe on each plate awaits us. Near the tented table, a bar serves wine, cocktails, and locally crafted beer, flanked by several fire pits and log-bench seating. 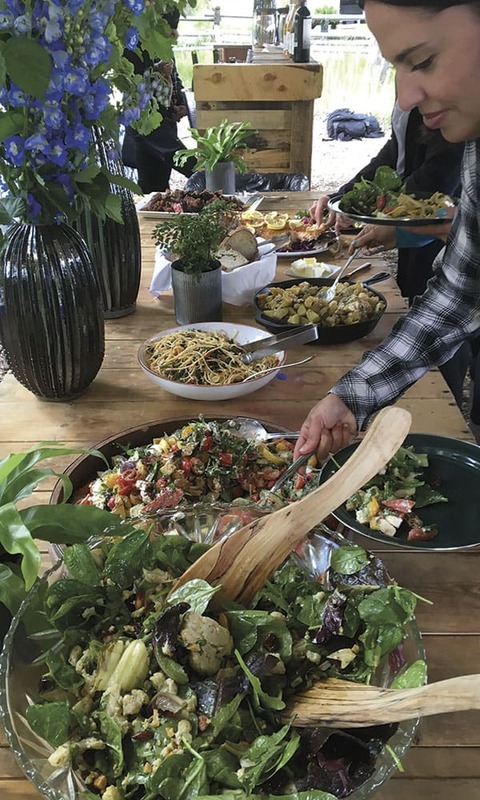 Again, Chef Jarrett Schwartz presents an elaborate array of delicious salmon, beef brisket, and dry rubbed ribs, as well as several fresh salads. The table conversation grows livelier and we feel the entire group grow closer sharing the nostalgia of the trip as it draws to the end. Spring Creek’s award-winning Granary Restaurant offers breathtaking views. Photo by Rhiannon Deremo. After finishing supper, we move to an open fire pit, this time to roast marshmallows and make s’mores. Before heading off to bed, Carly, one of the GMC team members, mentions that the stars are amazing at night but that you have to stay up late to wait for the sky to get completely dark. Determined to see the beautiful stars, a group of us continued to roast marshmallows and chat. One by one, people give up and retire to their rooms until it was just a few of us. Tired from our whirlwind trip and sated from eating too many marshmallows, we meander back across the grounds in the dark, looking up and gazing at the upturned bowl of stars in the indigo sky every few feet. Once we reach our rooms, we wave goodbye to our newfound campfire friends and slowly make our way up the stairs where we collapse in well-earned slumber.